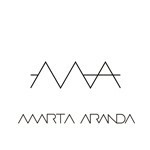 Marta Aranda is a multidisciplinary artist and fashion designer from Madrid, Spain. She expresses herself through fashion, and her work deals with the creation of links between the worlds of Art, Fashion and Design. Her fashion collections do not pretend to be like traditional seasonal fashion collections, but rather pieces of art materialized in textiles and garments. Her work focuses primarily on the study of the human body, especially the female form, the study of the female figure in our society, and its relationship with the social phenomenon that includes fashion.